alaTest a collecté et analysé 586 avis de consommateurs et d'experts pour le produit BT BT7600. La note moyenne du produit est 4.4 sur 5, tandis que les autres Téléphones Fixes Sans Fil ont une note moyenne de 4.0 sur 5. Après analyse des notes de consommateurs et d'experts, de l'âge du produit ainsi que d'autres facteurs, et comparé aux autres Téléphones Fixes Sans Fil, le BT BT7600 obtient un alaScore™ de 89/100 = Très Bien.
" arrived in good order and deliverd on time thank you "
" Easy to set up, very smart phone with great features. Great price. Would recommend you buy this product. Thank you to Argos who delivered this product within 3 hours over the busy Christmas period!. " 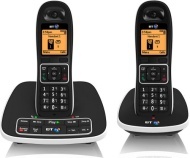 " lovely phones stylish have not tried the blocker yet as have had no nascence calls since I brought it "
" We bought these phones as ours had broken they had good reviews off people. We found them easy to set up and we set up the call blocking very easily .it is great not to have to keep answering unwanted calls ,we would recommend them . " BT 7600 Cordless Telephone with Answer Machine - Triple.
" easy to install and use, easy to follow instructions works perfectly i would recommend this machine "
" Great price. Was easy to set up and to use "
" This product was just perfect for my mother's needs and so easy to use. A great way to keep her 'mobile' and safe around the home. " " great telephone love that you can block PPI calls "